Looking for an Avon Representative? Guaranteed customer satisfaction and personal service when shopping. Helping you create an opportunity to earn money selling Avon online. Avon Campaign 10 2019 Catalog – Don’t wait for your rep’s next Avon order. Get your Avon fast by ordering online. This campaign Avon has come out with the new Glimmershadow liquid eyeshadow. 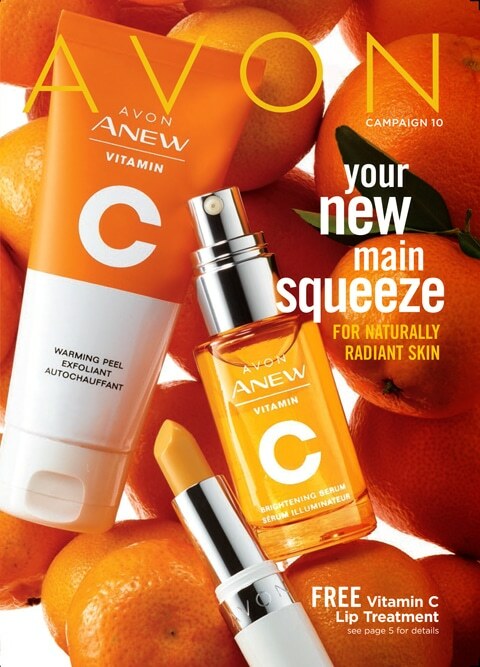 Enjoy viewing this Avon Brochure. Click on the image to take a look at our Avon Catalog library. Catálogo de Avon de campaña 10 2019 – No esperes a la próxima orden de Avon de tu representante. Obtenga su ayuno de Avon ordenando en línea. Esta campaña AVON ha salido con la nueva sombra de ojos líquido Glimmershadow. Disfrute viendo este folleto de Avon. Haga clic en la imagen para echar un vistazo a nuestra biblioteca del catálogo de Avon. View all of the Avon catalogs, brochures and sales flyers right here at Online Beauty Mill. View the active campaign. Shop from the Avon digital catalog, Avon brochures, Avon Outlet and the Avon Sales Flyers. Never shopped Avon online? Learn more about how to shop Avon online. View all the Avon discount codes, Avon coupon codes, special offers and free products with purchase. Looking for ways to help your organization or charity raise money fast? Avon Fundraising can be done 100% online. Who doesn't like getting stuff for free? Check this page often for freebies from Avon and from Monica. Learn how to become an Avon representative and the requirements for joining Avon. Ver la campaña activa. Compre de el catálogo digital de Avon, folletos de Avon, Avon Outlet y los folletines de ventas de Avon. Vea todos los catálogos de Avon más recientes y folletos de Avon, volantes de ventas para 2019. Hi! My name is Monica and I am an Avon Representative and have been selling for over 15 years now. Time flies when you love what you do. I started Avon so I could earn a little extra money and be a stay-at-home mom to my two children. Avon was the perfect fit for me. It allowed be to meet new people in my area and get out of the house. By the way when you have two kids you know why that’s important – a little thing called SANITY. Not to mention I could work my business at the McDonald’s playland while I called customers and wrote up my orders. Now my children are grown and have their own lives. But I am not an empty nester. I now have a new role. 5 years ago my parents moved in with me due to illness. I’m now a caregiver for both of them. And because of Avon I am able to help them. My business still works for me. Even though I am more homebound, I can provide Avon service to customers online. Besides most people nowadays prefer to shop this way. It’s just easier for busy families. Avon has a way of fitting into any lifestyle. So if you are looking for an Avon rep or need a new Avon lady, I’d be happy to be your representative. Here’s the link to my online store if you are interested in connecting with me. By the way you might also like my Avon Discount page to see all the specials and get your first shopping discount. Last but not least, if you need a helping hand getting your Avon business started like I did, please feel free to reach out to me. If you’ve already decided to join Avon you can connect with me as your mentor if you’d like by clicking here. Online Beauty Mill is one of the newest Avon Online Products Catalog sites featuring the latest Avon brochures online to Avon lovers locally and online. In addition, the website is filled with information about Avon products, tips, discount codes and a focus on community. Avon Representative Monica Naegele has been an Independent Sales Representative for over 15 years. Monica’s decision to become an Avon Representative, as well as an online Avon Representative and Team Mentor comes from her passion for Avon products and knowledge of skin care, makeup, jewelry and her love for helping others. And Monica’s proven skills in online sales and service, and as a team mentor are well noted. Combine that experience of running a successful Avon business along excellent customer service skills, Online Beauty Mill is quickly destined to be one of the favorite Avon sites on the internet. Online Beauty Mill - Recognized by Feedspot Good News! My blog was recently named in the Top 5 Avon Sales Blogs to Follow in 2019 by Feedspot. It's so encouraging as blogging is hard work! If you'd like to check out the great articles on Feedspot just the image below.